I move on to Mexico today and a rising star of Mexican fiction. I had reviewed an earlier novel by Guadalupe Nettel The body where I was born a couple of years ago.This book won the Preimo Herralde one of the leading prizes for Spanish language fiction. Her books have been translated into ten languages. She also featured in the group of writers picked for Bogota 39 for the best Latin American writers under 39 in 2007. I became Ruth’s lover convinced that in terms of love I was handicapped. At first, my attraction to her was minimal. I was seduced in large part to her elegance, her expensize shoes and perfume. I met her one evening at my friends Beatriz’s house, a swedish woman who had emigrated to New York at the same timeas I had, and who shows in a couple of SoHo galeries. Betriz has a loft decorated with funiture from the 70’s she has collectedfrom garage sales she often goes to. Claudio on how he meet his older woman Ruth. The story focus on two people first we have Claudio a young Cuban living in New York. Her has a rather small flat that opens out in to a wall. But it is the location of the flat that is the bonus Manhatten then he is in a relationship with an older woman Ruth. He has a strange relationship with her where he is in control of there relationship. He is a man of rigid habits he is a book editor, A man above overs in his ways sometimes. We meet Cecilla a young Mexican woman who has come to Paris to study literature. This young woman is drawn to the great graveyard of Pere-Lachaise. He flat overlooks this graveyard. she spends time wandering looking at the famous grave Chopin being one of them. I am always amazed how often Chopin crops up in books. he leads such an interesting life thou and such a young death as it is noted in the book. Now Cecilla notices her neighbor is also drawn to the graveyard they chat. But this is a short relationship. The book follows these two each t=chapter told by one of the other as we see how Claudio by chance ends up in Paris. “Is there something wrong?” I said defensively as I opened the door. I was wearing my own annoyed expression. “The radio” He replied, like someone giving a password. I was silent for a few seconds, trying to understand what he was refereing to, but it was useless. His reply surprised me. By that point, the presence of the radio had become a background noise I never thought about. “If it annoys you that much I can turn it off” I said, to put an end to the matter. Cecilla meets her neighbour Tom for the first time after this the two are drawn closer for a time. The other novel I reviewed by Nettel saw a woman growing up. Here we see a shy woman experiences Paris and has a small chance when she meets her neighbour but he isn’t so well and just as things seems to be going one way he has to leave to the country. Then we see Claudio a man living his in his world that he has drawn so many lines he is a man tied by not want to let himself free. His vanity at times is huge. So we have two people each with there own quirks and on different continents but like Chaos theory there is that one chance like a butterfly wing flapping causing something larger this is a book that follows two characters ripples in the world and wonders what happens when they collide. I love Cecilla as she wanders this graveyard looking at the names of those there. I was looking for a number of books to do for the 1977 club and this was another that cropped up as coming out in Arabic that year. Mahfouz was a Nobel winner. He was regarded as the first truly modern writer in Egypt and his books have been described as Existentialist in their style. He is maybe best known for his Cario Trilogy. A man that spoke out for what he believed in most of his books were banned in the Arab world to his Nobel win. It also gives me a chance to fill a gap in the writers that should be on this blog. Nothing like this had ever happened in the alley. The police only came near it in extreme emergencies. The clan chief’s numerous crimes were usually unattributed, thanks to the testimony of false witness. was inspector Faud Abd al-Tawwab going to do what nobody had done before him of Mohammed Anwar’s body was discovered on the path or under the archway? How had Muhammad had the insolence to go to the police for help, and why had the inspector been ready to challenge Nuh in this underhand way? The police were rare visitors to the Alley here because someone went outside the alley world. 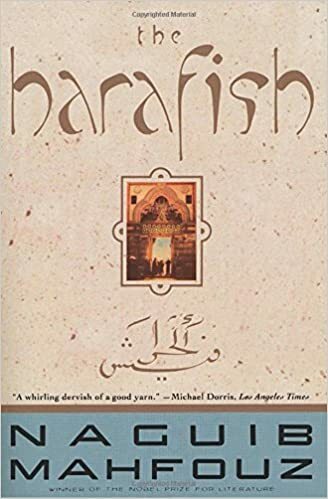 The harafish is a family saga told over ten chapters as we follow the family living in an alley from Ashur Al Nagi whom is the chief of the family in the first tale through the years and generations til the last story Ashur crops up again the chapters are told in small vignettes. I liked the style it was almost like reading or listening to gossip on the street among the Harafish as the people of the alley are called. Exist is hard at times I remember a line on page 301 where someone says “you’d preserve your youth forever ” this shows the toughness of this world. The cycles of the alley violence trying to get to the top is repeated over the chapters the characters are different sons or daughters of earlier characters. I loved the part in one chapter, when the police appeared which was considered an outrage as they liked to run there own little world. The emotions of the Nagi family and the harafish were set in turmoil by the unexpected return and sudden disappearence of Samah. His sons were probably the least affected of anybody because he came and went while they were asleep and anyway, as far as they were concerned, he was no longer much more than a faint memory, like their mother in Bulaq. His story was told far and wide, and became a legend and a cautionary tale. The opening of the fifth chapter and already past battles become like a myth or legend. This is a clever book as you think it is cardio and feel as though you know the timeframe of the novel. But nothing is ever said about the timeframe of the novel or the location of the book all we know is that the families live in an alley where the characters all live. A true family saga covering the years of a place. Mahfouz was a fan of Zola and Balzacs works and there is a feeling of their worlds here a tough look at life realist but also at the same time without time and place it could be another place even if you change the names and in that regard for me it is a true work of Existentialism of the question why are we here why are they there what makes their world. A great second choice for 1977club and for me another piece in the canon of books and writers I have covered on the blog. I hope at some point to bring the Cario trilogy to the blog. A fellow blogger Marina of the blog finding time to write is involved with the website Asymptote. Ask me if I want to review this book to highlight there Book club they also have a page on book trail. I was happy to review this as it is the second book by this writer her first was available from Peirene in the Uk the blue room I reviewed it here. This is her latest to be translated to English Hanne Orstavik has lived in Oslo since being 16, her first novel came out in 1994 when she was 25, she has since written twelve novels this was her third novel. The opening I wish I could do four orr five books a week. Most weeks I struggle to hit three books. Love is maybe a strange title for this book as it is about love but maybe the distance in love. The story is about a mother and son. The two the Mother Vibeke has moved her and her Son Jon too a distant village as she has taken a new job as an Arts officer. A lot of her story is about what she likes books trying to find articles that have been talked about at work. There is a sense as the narrative jumps between the two of them that there is a distance in the relationship it is a matter of months since they moved there. Jon is trying to fit in we see this as he goes around selling raffle tickets for the local sports club he has joined as he tries to fit into his new home. All this is the evening before Jons ninth birthday as we see him going out alone. This is a book that shows the detachment of modern society sometimes they both seem in the own world as the evening unfolds. Jon arriving home here grabbed me as so lonely an eight year old just wanders in by himself. This is a cold book in a way a mother and son that have grown apart. A strange dark feeling as for why she would let her eight years old out to sell the raffle tickets in the evening unsupervised. Maybe this is my oldfashioned views of the world but it just felt as thou the mother was so absorbed in her own world she hadn’t even thought of her poor sons birthday. A simmering undertone of a relationship broken by the move and a young boy drifting towards disaster. I can see why Karl Ove called this her strongest book it is bleak and dark but also a compelling read as over the even the story of the two characters unfolds. As an ever-growing sense of foreboding is given in the book. The Asymptote book club is a great idea to draw reads into world lit and this is a great choice as it leads to the current crop of the great Nordic writer’s around at the moment like Karl Ove or Helle Helle which Martin the Translator of this book has translated.